Ernest was born in 1886, the son of Albin George Davis and his wife Amelia née Williams. His father was a mason, describing his occupation in 1911 as a 'stone & marble' mason. This suggests that he may well have been employed by T Thorn and Sons, the town's leading monumental masons and the craftsmen who created the Newbury Town War Memorial in 1922. The family lived at 56 Russell Road (also known as Prospect Cottage). Although Russell Road largely consists of typical Victorian terraced housing the Davis residence was older and larger, quite possibly a very early barn conversion. The additional space would have been very useful as Albin and Amelia had eight children. Their eldest child, Percival, followed his father's trade as a mason but Ernest, the second child, became a billiard marker. Billiard markers worked at billiard halls or clubs and acted as scorers/referees for games of billiards. In Ernest's case he worked at Jimmy Tufnail's billiard rooms in The Arcade (then known as Church Arcade). It is a mystery how Ernest came to sign up in Chelmsford for the Suffolk Regiment, or when he did so. He was posted to the 12th Battalion of the Suffolks, which first went to France in June 1916. Perhaps Ernest went with them, perhaps he was drafted to them at a later date. 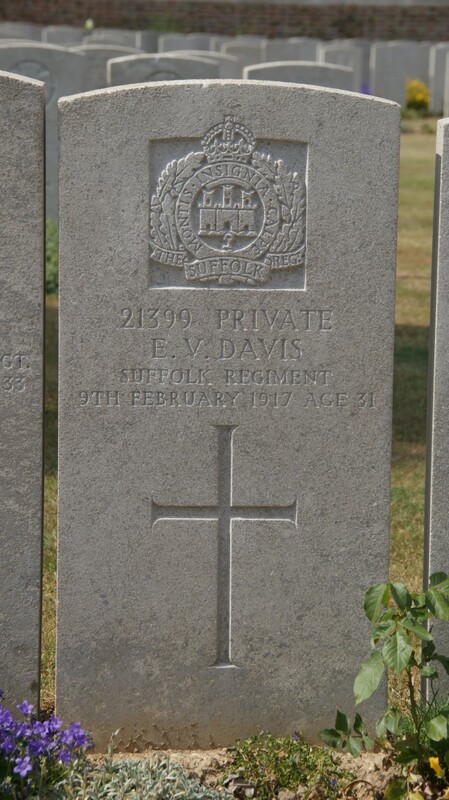 DAVIS – Feb 8, Ernest Victor Davis, of Prospect-cottage, Russell-road, in France, of acute bronchitis, aged 31. Mr A G Davis, of West-fields, Newbury, has received the sad news that his son, Ernest Victor Davis, of the Suffolks, has died in France, in hospital, from acute bronchitis. He was in hospital recently with influenza, but had returned to his duties. There seems no doubt that he succumbed to the after effects of that malady through lack of care and from exposure too soon after his illness. He was well-known in Newbury, having been billiard marker at Mr Tufnail’s, and also taking an extensive newspaper round. Mr Davis has three other sons now serving, Edgar, in the Engineers, went out at the beginning of the war; Harold, the youngest boy, in the Hampshires, has just gone out; and Percival, the eldest, in the Engineers, has been for some time acting as a fireman in London. In addition, there are two sons-in-law serving – W R Green, in the Engineers, has been wounded in the Persian Gulf, and the other, H Sharp, in the Marines, is at present in hospital at Plymouth. His body lies in Bray Millitary Cemetery, Belgium in grave XII D 2. During 1917 this cemetery was used by the 5th, 38th and 48th Casualty Clearing Stations - suggesting that one of these was the 'hospital' where Ernest died. His name is commemorated on Newbury Town War Memorial.